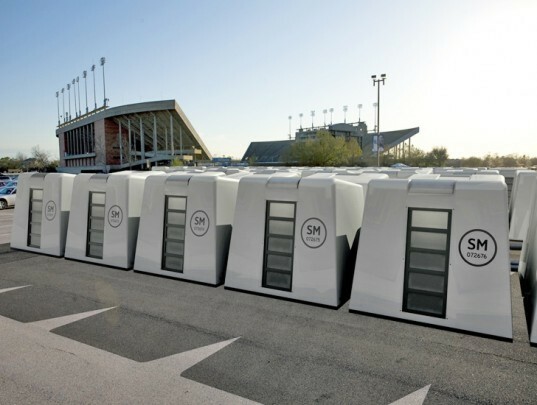 Michael McDaniel initially designed his Exo emergency shelter in response to the lack of adequate housing post Hurricane Katrina, and for the past eight years he's built and tested prototypes of the stackable, portable, and reusable emergency housing solution. Now McDaniel and his team need funding to push the project to the next level - real world testing and use by refugees in Syria. 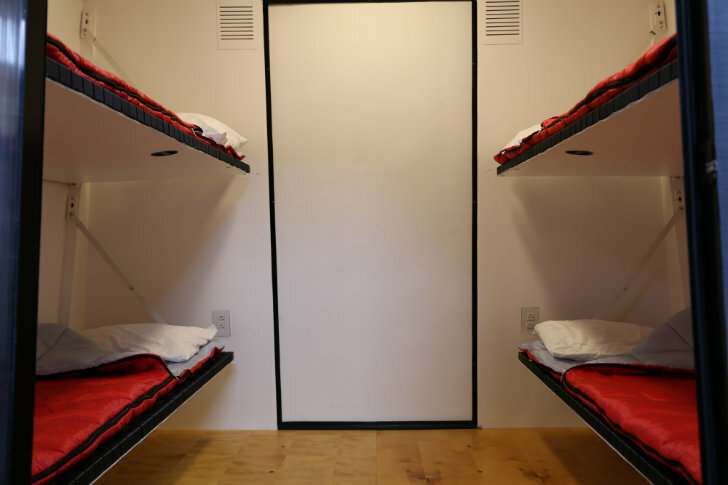 Funds raised for the Reaction campaign on IndieGoGo will send real shelters to families in need and provide critical data to improve future models. The Reaction Housing team is currently working on their next stage of development, which involves real-world testing in a refugee camp in Syria. They have teamed up with the Maram Foundation and will deliver at least 5 units to families there, who will offer feedback on their experience. Currently, the team is seeking $50,000 through an IndieGoGo campaign to raise the necessary funds, and hopefully the project will be overfunded so that more shelters can be sent over. Results of the Exo testing in Syria will inform modifications and improvements to the design and make them even better equipped to help families in need after disasters, emergencies or conflicts. The Exo Shelter is inspired by the humble coffee cup - a sturdy, stackable, insulated object that is easily transported and utilized to deliver life-saving sustenance. Turn that coffee cup upside down and you've got an emergency shelter. McDaniel took that idea and developed it into a workable prototype that could safely and comfortably house four people inside. 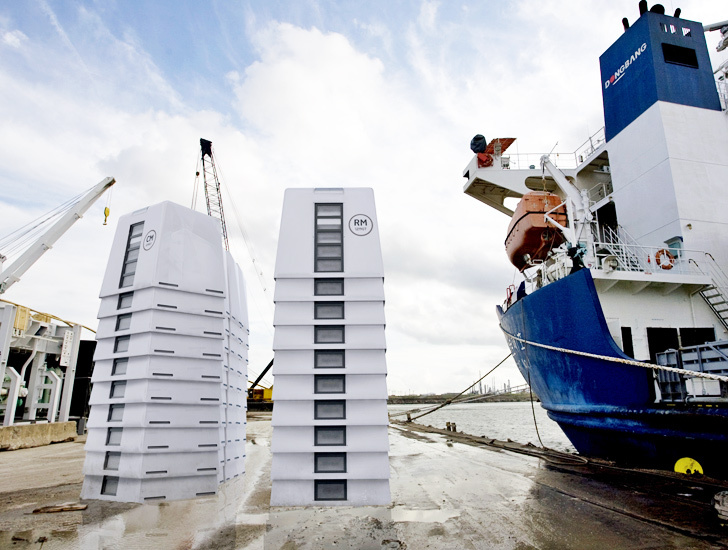 The stackable units can be efficiently transported on trailers and easily set up by four people without any equipment in just minutes. This allows a response team to rapidly deliver and set up emergency housing faster than other methods currently available. Exo units can be clustered together in a variety of configurations and even connected together to provide larger living quarters. A rendering shows how a large compound could be set up with Exo units in clusters. Each unit is equipped for lighting and can be connected to outside power and air conditioning. Locks on the doors provide security and safety for those inhabiting the units. Each unit can comfortably house 4 people on fold-out bunks. Units are wired for networking capabilities so that aid responders can keep track of which units are online or offline. The Reaction Housing team is currently working on their next stage of development, which involves real-world testing in a refugee camp in Syria. They have teamed up with the Maram Foundation and will deliver at least 5 units to families there, who will offer feedback on their experience. Currently, the team is seeking $50,000 through an IndieGoGo campaign to raise the necessary funds, and hopefully the project will be overfunded so that more shelters can be sent over.